We both graduated from Oregon high schools, and also started our professional careers there–it was a great launching pad! My love to my wife and business partner Rebecca and son Byron who are here, and also to my other two boys Nick and James who aren’t due to their educational responsibilities back home in California. Hurrah to my fellow honorees, particularly Bart Silverman whom I have known since 1969, and who is one of the most inspiring photographers on the planet. And a special thanks to Lucie Founder Hossein Farmani for creating this wonderful and significant award, co-founder Susan Baraz, and executive director Cat Jimenez . I shouldn’t even be standing here. I went to Vietnam when I was 24 and after many close calls in combat did not expect to make 25. Everyday since has been a windfall. But many of us weren’t that lucky. Right before I took off for Saigon in early 1971 to cover the war, a Vietnamese army helicopter carrying four photographers was shot down over Laos. Everyone was killed including Kent Potter of UPI, the person I was heading out there to replace. Another was Larry Burrows of LIFE Magazine. I never met him, but he had a huge impact on my career. His astonishing and dramatic photos from Vietnam struck a note with me that resound to this moment. Forty years after that tragedy, my friend and colleague Chris Hondros, along with Tim Hetherington, perished in Libya covering the action. They, and so many other dedicated photographers died pursuing their passion. It’s essential that real photographers roam the world casting light into corners where others fear to go. Their images carry emotion and insight directly to your heart and soul. A keen eye and the ability to condense a story into one searing image is irreplaceable. We will always need that cadre of professionals who hang it out there to show the truth. Photographers who have documented the dark side of humanity also know the pain that lies beneath their photos. The pictures may never be able to convey the visceral experience of what it took to get them, or the photographer’s commitment to the importance of making these images. We don’t make history, but our photographs help to change it. They inform, arouse, and inspire action. They tell stories that range from the joy of life to tragedy. We are the witnesses who keep history’s visual flame. It is our charge to accurately and honestly portray those whom we photograph, and to create pictures that are fair, objective and made with a compassionate eye. I salute those who continue to take photos that startle the world, pictures that make us sit up and take notice. My deepest respect goes to those who died trying. Their sacrifice and their photographs have helped make the world a better place. WHO IS IN GRAND RAPIDS THURSDAY NIGHT? SPACE IS LIMITED!! CALL NORMAN CAMERA'S GRAND RAPIDS LOCATION AT 616-954-9920 TO RESERVE A SEAT OR SIGNUP ONLINE. My New Book Website is Live! The "David Hume Kennerly On the iPhone" website is up and running. It gives an overview of my new book, a link to order it, and some excerpts. ”‹In one of my longest-distant interviews ever, NPR's intrepid Don Gonyea reached me at the Hotel Skaftafell in Freysnesi, Iceland as I was preparing to scale the Svinafell Glacier last week. He wanted to talk about President Ford's first days in office 40 years ago, and I wanted to discuss the spectacular sights of Iceland. He won out, and what follows is a terrific piece on the former president, with a minor contribution from me. 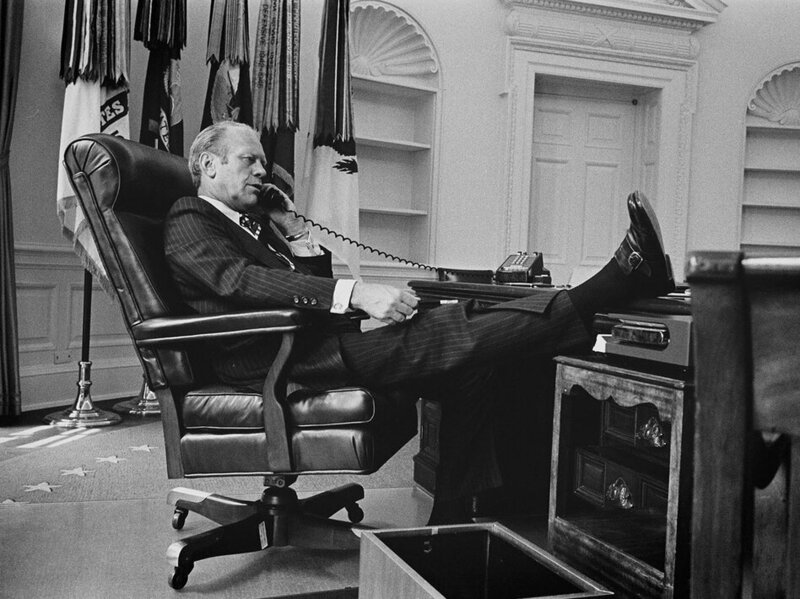 Forty years ago, America was getting to know a new president: Gerald Ford. He took office after scandal forced the resignation of Richard Nixon, famously declaring: "My fellow Americans, our long national nightmare is over." Taking on the presidency meant a transfer of power unlike any the country had ever seen. Ford often said that he had never aspired to the White House. But here he was, in the summer of 1974. "When he walked into the Oval Office, it had been stripped bare of every memento and every paper. It was like a piece of rental housing," says Barry Werth. 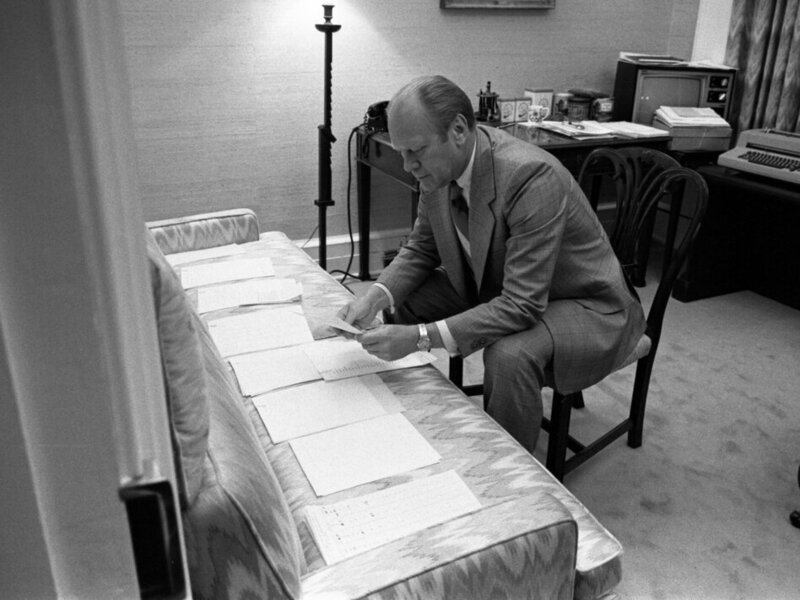 He's the author of31 Days, which looks at President Ford's first month in office. Beyond moving in, there was a long list of problems for the new guy to deal with. "The Cold War was at its height," Werth says. "Vietnam was winding down in a dangerous way. We were having crisis in the Middle East. The first oil shocks. Extreme inflation." Werth says Ford was tasked with declaring his independence from Nixon to show that everything was going to change, while also show a continuity of government. 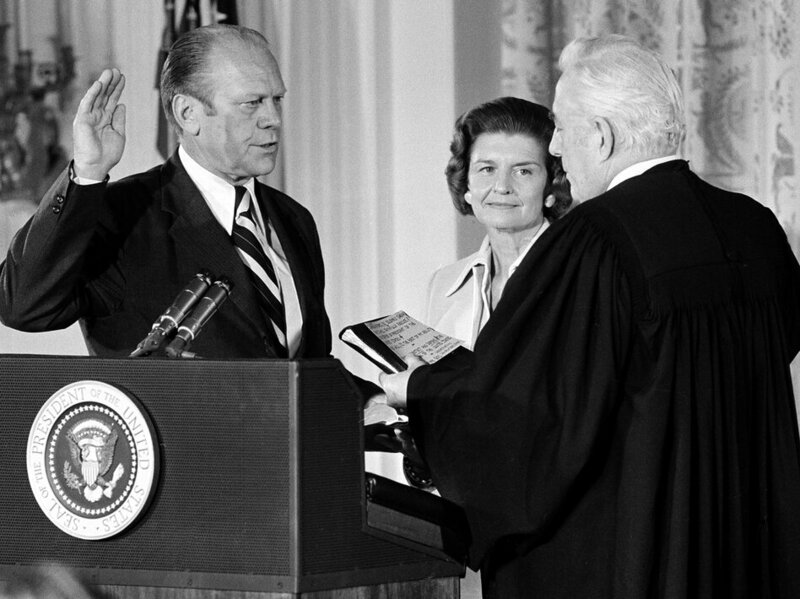 Ford realized quickly that if he were seen solely as a caretaker president ”” with no plans to seek the office on his own in 1976 ”” he'd immediately be considered a lame duck. That would make his job even tougher. In those first days he began looking for a vice president. Some of those potential choices would play prominent roles in American politics for decades to come. At the time, Pennsylvania Sen. Hugh Scott talked to NPR about some candidates he'd discussed with the new president. "I mentioned a couple of names, including Rockefeller and Bush. Some very well qualified names came up: Sen. Dominic of Colorado, Sen. Javits and Sen. Dole, and others," he says. That's Bush as in George H.W. Bush, and Dole as in Sne. Bob Dole. Also angling for the job was Donald Rumsfeld, who much later served as Secretary of Defense. Eventually, New York Gov. Nelson Rockefeller got the VP job. That first week, Ford also addressed a joint session of the U.S. Congress. He pledged "communication, conciliation, compromise and cooperation." For all the political drama, Ford's personal story and laid-back demeanor was just as interesting to many observers. 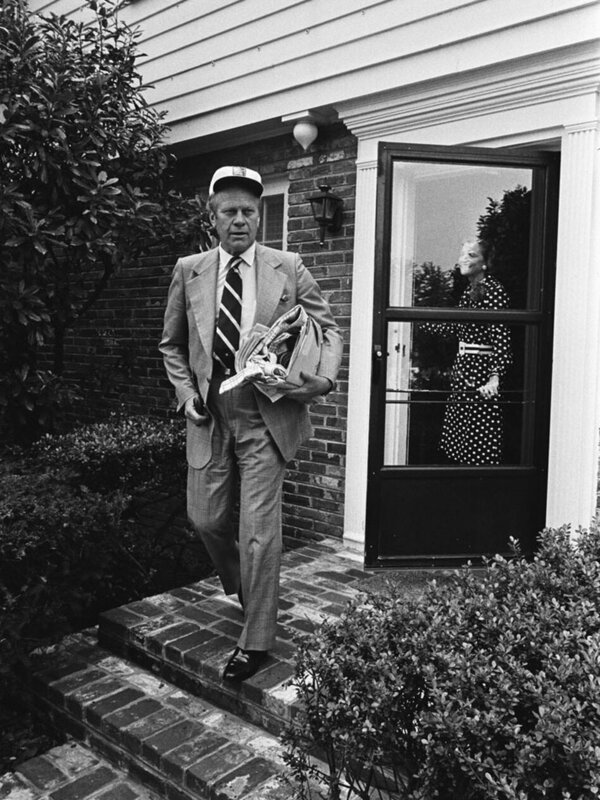 For 10 days, Ford and his family continued to live in their split-level suburban home in Alexandria, Va. He commuted 10 miles to the White House. 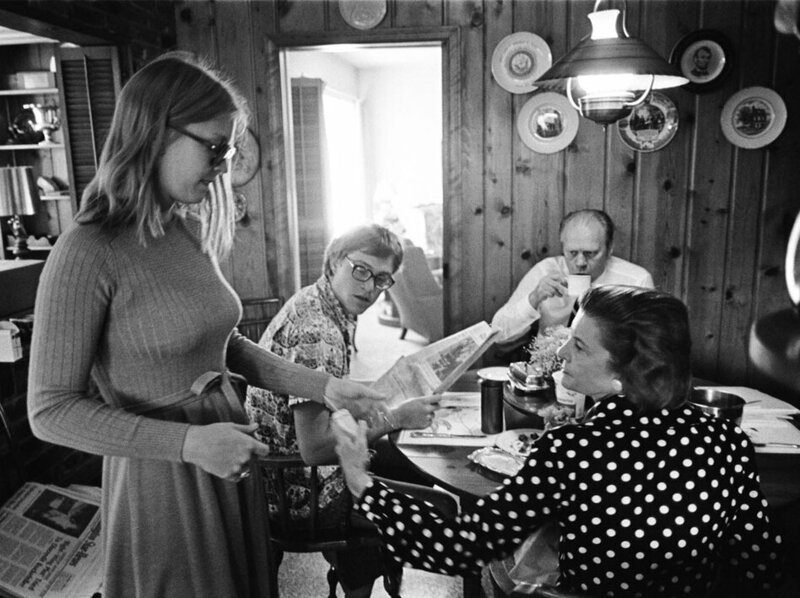 One memorable image from that week (above, in slideshow) shows the family ”” the president, Betty Ford and two of their children ”” in their knotty, pine-paneled kitchen reading the morning papers and drinking coffee. 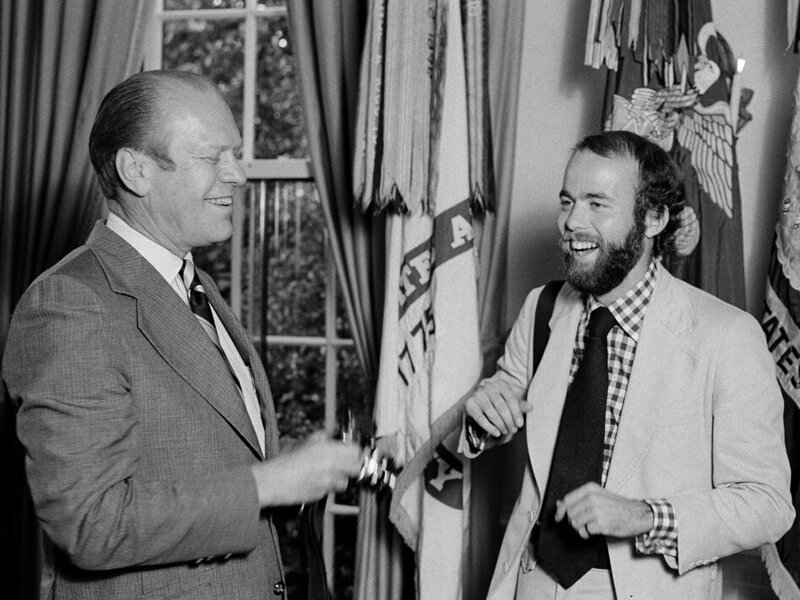 David Hume Kennerly was an award-winning photojournalist who became Ford's official White House photographer. "That picture was taken just before he was ready to go out the door to go to the White House. That was normal," Kennerly says. "They were talking about normal family things: who's gonna get the dry cleaning, who's gonna do this? Who's gonna do that?" Kennerly says they looked like an average American family because they were. The public wished Ford well and immediately took to him. Then, in September, Ford pardoned Richard Nixon. He insisted it was necessary for the country to move beyond Watergate. But it would change public perception overnight, and end much of the goodwill he enjoyed in those very first days. AUGUST 17, 2014, 8:43 AM |Friday marks the 40-year anniversary of President Richard Nixon's resignation after his role in the Watergate cover-up was exposed. Ben Tracy talks with two men who captured behind-the-scenes moments in photographs and audio, revealing more about those fateful last days.